Collaboration is essential to the success and growth of every Miracle Network Dance Marathon program. 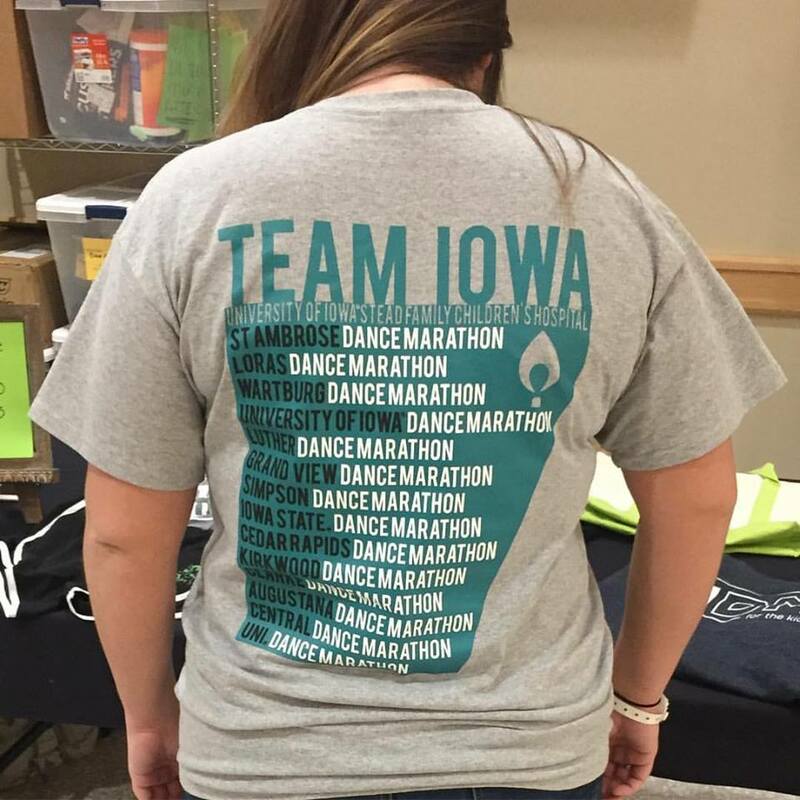 Throughout the year, many programs participate in collaborative efforts with entities including Miracle Network Dance Marathon programs on other campuses, university departments, student organizations and community organizations. These collaboration should advance the growth and success of a Dance Marathon, provide value to the other organization(s), and actively involve both the Dance Marathon program and the other organization(s) in the planning and implementation. 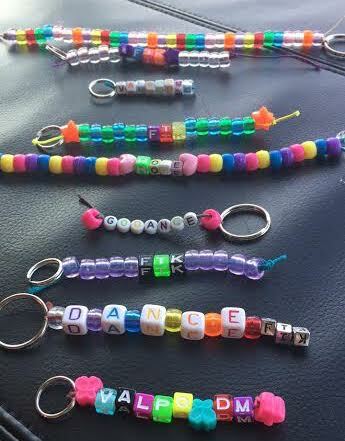 Below are some examples of the collaborations that Miracle Network Dance Marathon programs participated in during the 2016-2017 academic year that were submitted for the Best Collaboration award, which will be presented at the 2017 Dance Marathon Leadership Conference in July. This past February, for the first time ever, Auburn University Dance Marathon and University of Alabama Dance Marathon were held on the same day. Knowing what a rare opportunity this was for their programs, they decided t0 team up for a surprise “Iron Bowl hour” during their respective events. Named after their schools’ annual football rivalry game, the two programs spent an hour at their Dance Marathon events working to increase awareness in the state of Alabama for Miracle Network Dance Marathon while implementing a fun, competitive in-event fundraiser to help both programs meet their goals. Auburn University Dance Marathon invited the majorettes, the cheerleaders, the Tiger Paws (the dance line), and their mascot Aubie to their Dance Marathon event to build up school spirit and encourage dancers to use their Auburn pride as a motivator to fundraise. University of Alabama Dance Marathon notified their dancers throughout the hour with fundraising updates to motivate them to try to beat Auburn and encourage them to reach out to friends and family who would want to see Alabama win from throughout the state. Iron Bowl hour allowed the rivalry to push both programs to fundraise as hard as they could, resulting in two close totals of which both schools could be proud, with Auburn raising $19,060.83 and Alabama raising $17,931.01, while also creating a partnership between the two schools that will last well into the future. This past year, Dance Marathon at BGSU made a strategic effort to collaborate with the University, other student organizations, and the Bowling Green Community. To kick off the year, they collaborated with the Black Swamp Arts Festival, working during the entire festival, picking up trash, and helping in any way they needed. It was a chance for them to work directly with the Bowling Green community, build relationships, and spread awareness about their organization. They collaborated with the University on many different levels. They hosted an event called “Pie BG,” where the Associate Dean of Students, one of their Advisors, and other faces of BG volunteered their time to be pied for a small donation to Dance Marathon. They also had a table at multiple University events like Campus Fest, Get Involved Fair, and Big Playground. They partnered with the BGSU Hockey team to hold their annual Teddy Bear Toss. One of DM at BGSU’s goals for the school year was to gain more University support and spread awareness of their mission to different organizations, gain new partners, and work collaboratively to help other organizations, as well as their own, reach their goals. They created a video where they invited different organizations to participate and be a part of. This video showcased everyone involved and created bridges between DM and other organizations on campus. This resulted in more organizations creating teams during ZiggyThon and Dance Marathon team members were able to learn about and get involved in those other organizations as well. Team Iowa Push Day occurred on December 1st, 2016. Throughout the state of Iowa, passionate students from 14 colleges and universities came together to make miracles. The couple months prior the presidents and directors of these programs held conference calls and collaborated to make this day happen. The programs set a goal to raise $183K in one day for the brand new University of Iowa Stead Family Children’s Hospital, in honor of the 183 beds in the new building. They also had a goal to just promote their organizations on their respective campus to raise awareness and get dancers excited to make miracles–all under one common goal. The students created a promotional video for social media, a graphic that was updated throughout the day to track fundraising, and a t-shirt design to be sold to committee members which featured a list of all the schools partaking in the fundraising challenge. Although the schools did not reach their fundraising goal, they still were able to raise over $94,800 in just one day for their local hospital! 177,331.02 miracles. This is the impact that Dance Marathon at Louisiana State University and University of Alabama Dance Marathon have been able to make collectively over the past three years. Although it only lasts for a week, both DM at LSU and UADM’s leadership teams work collaboratively throughout the entire year to ensure a cohesive execution plan is established. The planning began for this year when members of DM at LSU and UADM met at DMLC 2016 to discuss terms, rules, and other ideas that we felt would be beneficial to each program. After a week of events that bring awareness for the kids Our Lady of the Lake Children’s Hospital and Children’s of Alabama Hospital, there is a sense of pride resonating from both organizations. Dance Marathon at LSU raised $51,000.51 and the University of Alabama Dance Marathon raised $32,814.24. Together, we were able to make over $83,000 miracles. Adding to the countless miracles we have made together over three years. 3 years, 3 weeks, $177,331.02 miracles. STATEDM worked with RebelTHON at Ole Miss by creating a rivalry week in which they competed to see which program could raise the most money during the week before their football game on Thanksgiving weekend. Both programs held individual fundraisers and updated each other at noon each day on the progress of their fundraising. The goal of this collaboration was to use competition and the rivalry that spreads throughout the state to raise money for both of their programs and spread awareness for both hospitals. Through this collaboration, they were able to raise a collective $32,332 ($18,321 from STATEDM and $14,011 from RebelThon) and register 80 dancers during the week. With students reaching out to family and friends for donations, more people learned about Dance Marathon at State and Ole Miss and what each program is doing for their local CMN Hospitals and what those hospitals are doing for their communities. Today, RebelTHON is challenging YOU to take the Egg Bowl Challenge: raise $64 in one day FTK! Ole Miss is leading Egg Bowl wins 63-43-6 and we want to help them get to that 64th win! Let's #BeatState ON and OFF the football field! Happening right now on the drill! !Come out and Pie a Rebel and get some sweet treats😋 help us #BeatOleMiss by raising the most money FOR THE KIDS!!!!!!!! We weren't joking. Egg a landshark and help us #BEATOLEMISS for just $1 !!!! Come find us on the drill field ! This past spring, OttoTHON and University Union at Syracuse University teamed up to create a Spring Festival on their campus’s quad. OttoTHON’s main goal for this spring event was to reveal their fall event date, register dancers, and promote OttoTHON while having a fun day on campus! Each organization brought various supplies, such as t-shirts to give away, food, and inflatables, and worked on creating an enjoyable atmosphere for students. As OttoTHON is still a newer organization on Syracuse’s campus, they found value in partnering with an organization like University Union that has a strong presence on campus and can help draw new students that have not been involved in Dance Marathon before. One of Terp Thon‘s main goals of the year was to increase their university support and involvement, particularly from faculty, staff and university departments. Through collaboration with university officials, they hoped to unite our campus community For The Kids and establish Terp Thon as a University of Maryland tradition. They collaborated extensively with several departments within the Division of Student Affairs on their campus. University Recreation and Wellness put on a successful second annual Zumbathon benefiting Terp Thon, an event that contributed to both their fundraising total and campus presence. UMD Dining Services, a longstanding supporter of Terp Thon, also stepped up their support with an in-kind donation that covered food for our Dance Marathon. New supporters included UMD Residence Life, which helped place Terp Thon posters on every floor of the 40 residence halls on campus. UMD’s Department of Transportation Services advertised for Terp Thon on the front of every bus in their system in the week leading up to our Dance Marathon. 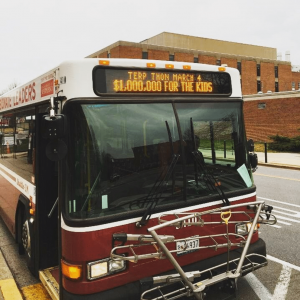 DOTS also ran a Terp Thon bus route day-of to bring participants from all across campus to the Dance Marathon event location and made a monetary donation to their operations by contributing a portion from UMD parking tickets. Following meetings with the Department of Student Affairs Vice President’s Office, we were able to secure display banners on the front of our student union as well as the entrance to campus. These banners firmly established our presence as not simply a Dance Marathon, but rather the University of Maryland’s Dance Marathon. A new partnership with the university’s Do Good Institute, a department championing “Do Good” initiatives on campus, helped them secure an exclusive video feature shared from the University of Maryland’s official Facebook page. 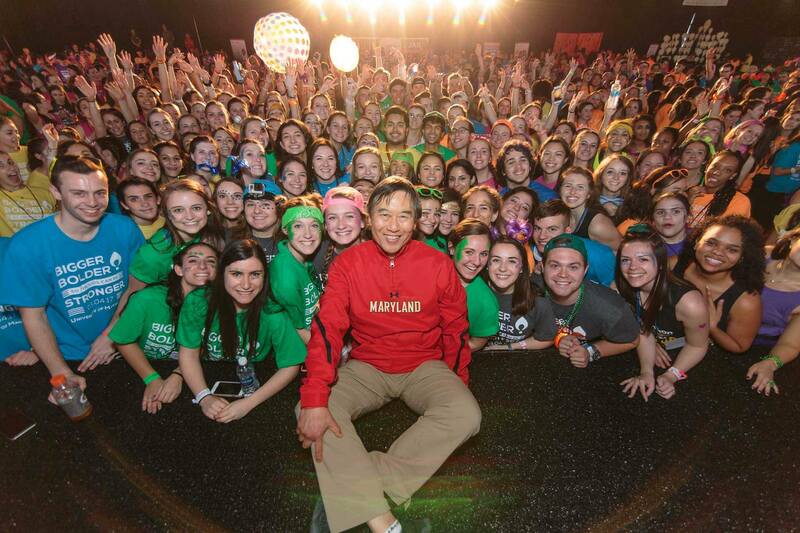 Their efforts towards collaboration with the University culminated at their Dance Marathon event where UMD President Wallace Loh made his first Terp Thon appearance. President Loh’s speech reaffirmed what their year-long efforts had contributed to campus culture. The support that they received from the University helped promote a theme they had been carrying all year – to make Terp Thon a tradition at UMD. 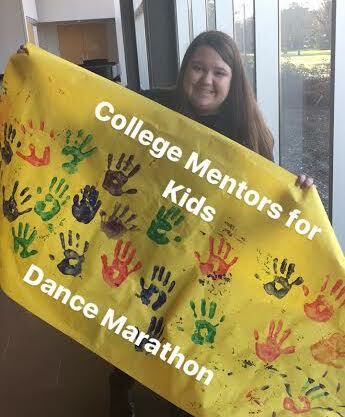 This year, Valparaiso University Dance Marathon paired with College Mentors for Kids for one of their weekly activities. College Mentors for Kids is a student organization that pairs college students with local elementary students with hopes of getting the younger students thinking about college and all that it has to offer. For their collaboration activity, members of the Executive Board and the Morale Team worked with College Mentors’ Activity Directors to create an program that was not only enjoyable to the college students and the elementary students, but educated everyone on what Dance Marathon is, why it’s important, and how they can all help our mission. They hosted a mini Dance Marathon with the kids, with dancing led by Valpo DM morale team members; made inspirational cards for the children at their local hospital; made signs for the Valpo DM dancers; and helped the elementary school students make key chains that were then used as an in-event fundraiser for their hospital during Valpo DM. This collaboration created a strong relationship between Valpo DM and College Mentors for Kids. The activity helped spread the mission to a wide variety of students around campus that share the same passion for kids, with some of them registering after the event. 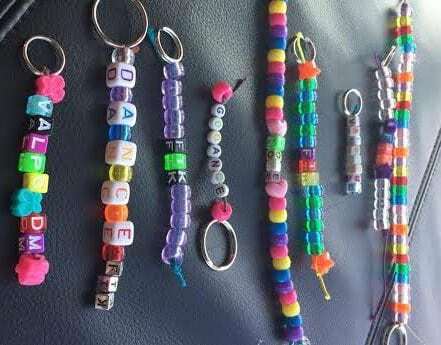 It also helped Valpo DM begin to establish a connection with the local Valparaiso community by getting the local elementary students involved and spreading the word to their friends and parents. They hope to continue this collaboration, as they were inspired seeing children in their own community supporting the local hospital.